About this Virtual Run: Autism affects 1 in 68 children and is the fastest-growing developmental disorder in the United States. There is no cure, but with continued research, there is hope to solve the puzzle, piece by piece. Support autism research and awareness by registering for the Piece By Piece virtual 5k/10k/Half Marathon. This is a virtual race, meaning you can run or walk whenever and wherever you want. All registrants will receive a personalized electronic race bib and a truly magnificent 4″ medal. 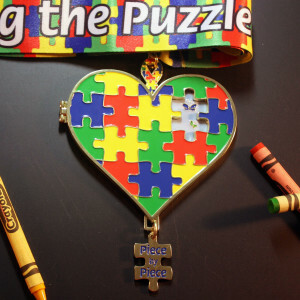 The medal is heart-shaped locket with the missing puzzle piece hanging from the bottom, and the heart opens to reveal a special message on the inside. The hanging piece can be placed in the open spot in the heart, where it will be held in place by magnets to complete the puzzle. But wait, there’s more! The inside of the medal features several butterflies, including a large red one at the bottom. In 10 of the medals, this large butterfly will be GOLD instead of red, and anyone who finds a GOLD butterfly inside their medal will win a Virtual Strides medal hanger and a $50 Gift Card! As always, medals will be shipped after you upload your results or at the end of the virtual race period, whichever comes first. Medals containing GOLD butterflies will be randomly distributed to Piece By Piece virtual run participants throughout the race period. For complete contest rules and details, please read the Official Rules. Found a Gold Butterfly? Fill out the Piece By Piece Prize Claim Form by 11:59 p.m. EST on March 31, 2016 in order to claim your prize! About the Charity: Autism Speaks is the world’s leading autism science and advocacy organization, dedicated to funding research into the causes, prevention, treatments and a cure for autism; increasing awareness of autism spectrum disorders; and advocating for the needs of individuals with autism and their families. A portion of the proceeds from this virtual race (at least $5 from each registration) will be donated to Autism Speaks. For more information about this charity or to make a direct contribution, please visit AutismSpeaks.org.